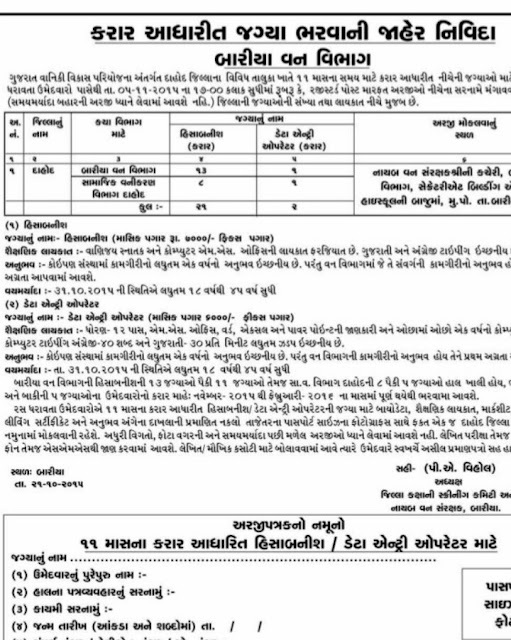 Gujarat Forestry Development Project (GFDP), Dahod for recruitment for below mention posts on 11 month contractual bases. For more details about this recruitment e. g. qualification, age limit, selection procedure, how to apply and application format as under. You can view official notification by following link. Commerce Graduate & having computer M.S. Office course required. Required Gujarati & English Computer Typing. 12th pass, having knowledge of M.S. Office, Word, Excel, power point & minimum 1 year computer course. Having minimum computer typing speed in English 40 wpm & Gujarati typing 30 wpm. Selection Process: Selection will be based on written/oral test & personal interview. How to Apply: Interested candidates can apply with prescribed template format along with attested copy of relevant certificates like bio-data, educational qualification, mark sheet, Trial certificate, school living etc. & recent passport size photograph to given below address by hand or Registered Post. Send your application at here: Deputy Forest Officer's Office, Bariya Forest Department, Secretariat Building, Besides S. R. High School, Mu. Po. - Bariya, Di. - Dahod.